Summary: I wonder, is there a bit of worldly ambition present in these men that He had called to be His disciples? I believe they may have been doing a bit of bragging among themselves, and now they come to Jesus to see who He thinks is the greatest disciple. There never was a greater pattern for humility than Jesus, and there was never a greater preacher of it, than Jesus. On several occasions, He had talked to his disciples and followers about it. I wonder, is there a bit of worldly ambition present in these men that He had called to be His disciples? I believe they may have been doing a bit of bragging among themselves, and now they come to Jesus to see who He thinks is the greatest disciple. Their question reveals that at this time, they didn’t have a clear understanding of the Kingdom of Heaven; their thinking is of an earthly kingdom, with external pomp and where they would rule along side Christ. Jesus had recently predicted His death and resurrection, and they expected that the kingdom would begin then, at His death. And they believed that now was the time for them to put in for their place in the kingdom. 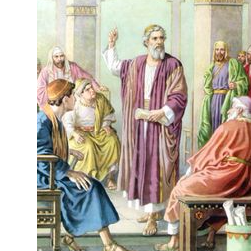 Each one of the disciples had some reason to believe that they would be great in the kingdom. Peter had always been the spokesman for the group, and so he thought that things should continue as always, and he would be the greatest. Judas carried the bag, and therefore he expected to be the heavenly Treasurer. Simon and Jude were almost related to Jesus, so they anticipated that a high office would be given to them. John is the beloved disciple, the favorite of the Lord, and therefore he hopes that Jesus will say he is the greatest. Andrew was the first one called, so why shouldn’t he also be first in heaven. This is a good time for Jesus to do some more teaching about humility. He set the child in the midst of them, not so they could play with him, but so they might learn from him. When Jesus was a child, He was found one day in the midst of a group of teachers. When Luke recorded what happened he wrote, “And it came to pass, that after three days they found him in the temple, sitting in the midst of the doctors, both hearing them, and asking them questions” (Luke 2:46). What Jesus is talking about here is conversion, not reversion. He is not saying that a person must revert back to his childhood in some unusual fashion, or that you have to become juvenile, to be saved. To begin with, He is diverting His disciples attention from the matter of holding an exalted place in the kingdom, to what is more important, being able to secure entrance into the kingdom. The important thing emphasized in this verse is the new birth. You must become a little child in the sense that you must be born again. When you are born again, you start out spiritually as a child. I don’t believe that new Christians should get involved with teaching or holding church office; they need to be discipled first. Paul wrote this about new converts, “Not a novice, lest being lifted up with pride he fall into the condemnation of the devil” (1 Tim 3:6). We see here that there are two things, which Jesus requires. First, you must be converted; your way of thinking must be changed, before you are fit for heaven. There are certain attitudes which must be reformed: they are pride, ambition and the need to dominate others. Second, you must become as little children. As little children, we must desire the sincere milk of the word. We must desire to read it and to listen to it preached. As children, you must not worry, but instead, depend upon your Heavenly Father to take care for you. Didn’t Jesus tell His followers: “Therefore take no thought, saying, What shall we eat? or, What shall we drink? or, Wherewithal shall we be clothed?” (Matt. 6:31). You must, like children, be harmless, and without a mean spirit. I wonder, is there a bit of worldly ambition present in these men that He had called to be His disciples? I believe they may have been doing a bit of bragging among themselves, and now they come to Jesus to see who He thinks is the greatest disciple.